Now that Arizona temperatures have begun their climb, road trippers already may be planning destinations to the higher elevations. At 4633 feet, Sierra Vista offers visitors many outdoor recreation activities without the harsh Valley heat. Arizona travelers can enjoy both sun and shade at a cool park at the San Pedro River – at the San Pedro Riparian National Conservation Area and San Pedro House. This long strip of 57,000 acres along the San Pedro River, maintained by Bureau of Land Management, surrounds one of the largest cottonwood/willow canopies in Arizona. 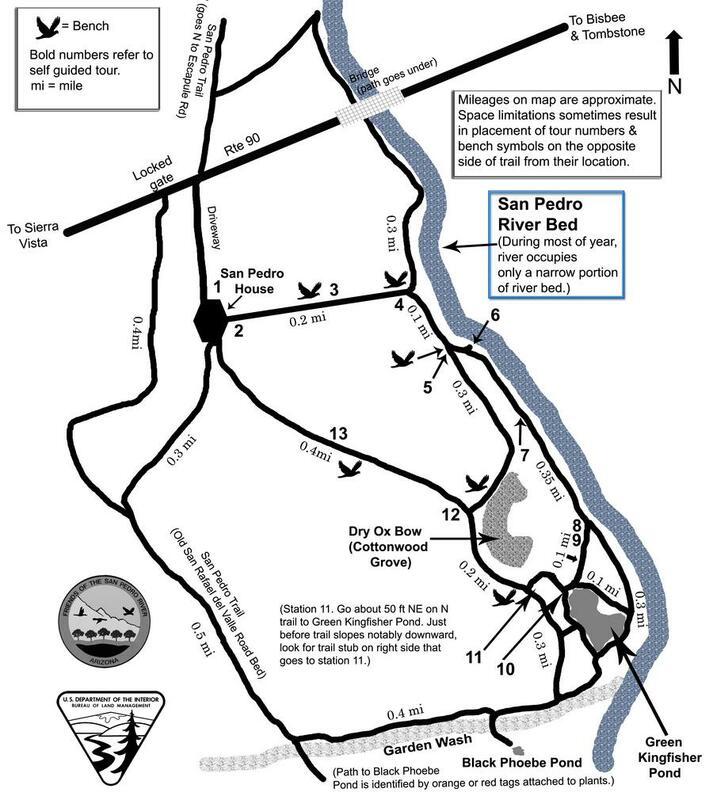 In February, I spent the best part of one Saturday afternoon strolling along the river on a short nature walk – a self-guided tour of the San Pedro House trails. As I started out along the path, I immediately realized why birders flock to this area. While red-winged blackbirds congregated around the cottonwoods, red-tailed hawks soared above the nearby grasslands. According to the trail map/brochure provided at the entrance about 350 species that either nest here or use it as a migratory stopover. The visitor’s center at the entrance is the San Pedro House, a one-time ranch manager’s house built by the Boquillas Land and Cattle Co. during the 1930s. Inside is a shop full of local history books, nature guides, maps and gifts. The store clerk, a volunteer member of the Friends of the San Pedro River, will answer questions about the park and the history of the area. It’s fascinating to learn how the area is being restored to its natural state after years of crop farming and cattle grazing. Trees along the river were cut down during the mining era to provide fuel for area smelters. As I walked along the river after a day of heavy winter rains, I’m surprised the water level isn’t higher. Recent dry conditions have soaked up the rain water like a sponge. After taking a closer look at the banks, it’s easy to see where significant flood event flows have creased the brush and snapped the branches. I’d recommend visiting San Pedro House and walking its nature trails to all. It’s a nice quiet picnic spot or rest area away from the busy traffic of the city. Take time to walk the easy path down to the river. Enjoy the cool shade of the cottonwoods. Don’t forget your camera! Once in a while I get a huge desire for a big, juicy burger. Who doesn’t? Again when I feel that craving I hope I’ll be near Sonoita, Arizona, so I can stop in The Café. Chuck and I recently enjoyed a leisurely Saturday lunch at this wonderful little country café, located just east of the intersection of State Routes 83 and 82, about 45 miles southeast of Tucson. While I can’t accurately testify about all the menu items, I can report my findings about the Blue Cheese Burger and “the day’s special” green chile cheeseburger. These were among the best I’ve had in a long time. Before an afternoon of wine-tasting at any one or more of the Sonoita and Elgin area wineries, you may want to have a bit of lunch. The Café is one of just a few eateries in Sonoita. The drive from I-10 south to Sonoita along highway 83 is part of an entire stretch of officially-designated scenic Arizona highway. You’ll see some of Arizona’s best farm and ranch lands. The restaurant itself doesn’t look like much from the outside, but who cares? You came here for a good meal, and you’ll be enjoying it either inside the rustic, oak and brick interior or you’ll be out on the patio gazing at the Santa Rita Mountains or the Canelo Hills while you dine. And those mountain views are excellent. On the warm, sunny Saturday we visited, the higher elevations were still under a layer of snow. A separate entrance to the patio from the outside often will indicate a restaurant has a dog-friendly area. Since each restaurant has its own policy and each Arizona county government has its own health restrictions, I will first inquire before I bring Molly over to the patio gate. The Café’s lunch list clearly shows that this restaurant is a few steps ahead of other Arizona rural cafés. The menu excites the taste buds with one of these selections: a Black and Bleu Salad with steak, blue cheese with greens and cucumbers, a Hot Bacon Vinn Salad with tomato, apple bacon and walnuts or a grilled cheese sandwich with cheddar, Swiss, provolone cheese and homemade pesto. The burgers we were served were really tasty — fresh, hot beef patty with melted cheeses, sesame bun, veggies and condiments on the side with crisp fries… need I go on? Most of us already know: it’s obvious to distinguish tourists from locals when you step into a restaurant. When you see a solid representation of locals, you can be confident of consistency in food quality, customer service and value. Chuck and I can’t wait to return. Traveling throughout Arizona to its smaller towns and cities, I’ve learned to allow time to explore the downtown areas. Window shopping, browsing through antique or thrift stores, visiting local attractions and relaxing in town squares have been important activities of my Arizona getaways. My visit to Safford’s historical downtown area provides another snapshot of an Arizona small town. Safford’s central business section is attractive and well-kept, but like most historic districts, some buildings still need a facelift. The downtown includes a well-defined Main Street, rolling out to a city and county government complex and park. Side streets include many additional businesses, offices and light industrial firms. Safford’s downtown reminds me of the “Back to the Future” movie town – “Hill Valley.” Walking down Main Street, one can envision Michael J. Fox’s character hopping on a skateboard and careening over parked cars. Even the Graham County Courthouse strikes a keen resemblance to Hill Valley’s courthouse – sans the clock. I guess classic revival or neo-classic architecture style must have been popular for government buildings constructed during the early 20th century. I was expecting to find quaint shops and eateries lining the thoroughfare, as I often have discovered in other Arizona ‘historic downtown’ districts. I found a few, but with all the historical storefronts, I really thought there would be more. Much of the street level commercial frontage seems to be undergoing renovation. Some existing businesses were simply closed on Saturdays such as professional and medical offices or business services providers. Obviously downtown Safford doesn’t exist to the whim of tourism and clearly Safford is not attempting to be the “shopping Mecca” of Arizona. Local commerce here is more about providing goods and services for its townsfolk. Granted, on this particular blustery Saturday, clouds and winds threatened monsoon rains so I didn’t spend as much time wandering the downtown as I’d hoped. However, a few shops did manage to capture my interest — I’m really glad I took the time to browse two women’s apparel stores: Sorella’s Elite Fashions and The Wear. I find independent, locally owned clothing retailers especially appealing. Call it nostalgia, but I like the way clothing, shoes and accessories are neatly and tastefully displayed at these shops. It makes shopping extra enjoyable. Friendly customer service is a bonus. Another recommended store is Gingerbread & Co., a gift and home accessory shop. If you’re drawn to decorative knickknacks, this place is for you. Plan to spend a while here, browsing through odds and ends: frames, signs, wreaths, bookends, you name it. Let’s put this way: if you have an empty spot on a wall, table or shelf in your house, it may be filled when you return from Gingerbread & Co.
With all this walking, visitors to Safford’s historic downtown may need a ‘little pick-me-up,’ so I can recommend A Step Back in Time Coffee Shop and Deli. This was another downtown highlight. Coffee, tea, smoothies, sandwiches, pizza and breakfast dishes make up the menu. I stopped in for a late morning latte and a chat with the barista on duty. Downtown Safford is still going through some changes; storefronts are being reconstructed and renovated, I learned. Businesses are moving to larger spaces and new shops are opening. A Christmas decoration shop was preparing its new inventory during my visit. There were several other interesting retailers I wanted to visit, but we just ran out of time: Pollock’s Western Wear — a well-reputed western apparel and boot outfitter, and a liquor store that appears to be located in the middle of an intersection, on a traffic island, called — appropriately enough: Triangle Liquor. Those will have to wait until next time. More reasons to visit Safford and Graham County in October: Graham County Fair is Oct. 11-14; Cowboy Poets and Music Gathering is Oct. 26-28; and Harvest Festival is Oct. 27. It’s that time again in Arizona – fall festival time! And if you love Mexican food, especially all kinds of salsa, then chances are you’ll want to head to Safford for the Arizona Salsa Festival Sept 28-29. Salsa is famous throughout the Southwest, and in Safford (located 165 southeast of Phoenix), there’s a literal melting pot of salsas of all types and flavors. As there are many different types of chile peppers; so is there a wide variety of salsas. And these varieties are likely to end up in the judging sample bowls for the Salsa Fest. Safford is one of the primary Arizona cities along what’s known as Arizona Salsa Trail. The ‘trail’ stretches between Thatcher and Clifton including smaller communities such as Duncan, York, Solomon and Pima. Several independent, family-owned Mexican restaurants, cafes, markets, plus a chile company and a tortilla factory participate in this culinary tourism route, dating back to 2005. AzGetawayTravel picked up part of the Salsa Trail this past weekend, as we ventured to southeast Arizona. We stopped for a Saturday lunch at La Casita in Thatcher. Naturally — and very typically — we guzzled up the hot sauce with the chips before our entrees arrived. I ordered the taco-enchilada-burrito combo and Chuck requested the taco salad with beef. His looked wonderful: crisp, freshly cut vegetables, ample amounts of roast beef chunks in a bed of warm tortilla chips. I was glad I had no rice or beans to accompany my combo, since it was obvious I would already need a “to-go” box. My meal was so tempting I almost forgot to take a photo before I dug in. Oops — that’s why the above photo shows the burrito already dissected. I couldn’t wait to take a taste of that green chile beef filling. After eating my cheese enchilada, I decided to ‘take out’ the taco. Tip: If you intend to try one of more of these Salsa Trail restaurants on a weekend getaway, you’ll need to plan ahead and check their business hours. Many of these are closed Sundays. Festivities for the Salsa Fest kick off on Friday evening Sept. 28 with colorful hot air balloons on Main Street in historic downtown Safford. Saturday’s events include Chihuahua dog races and costume contest, live music, custom car show, kid’s activities, jalapeno pepper eating contest and of course, the salsa making contest, salsa recipe judging and salsa sampling. Readers, I just have to ask: What’s your favorite kind of hot sauce or salsa? Do you like the smooth, blended red — or salsa verde? Or maybe a chunky style? Or are you a fan of pico de gallo? What’s your hot index?